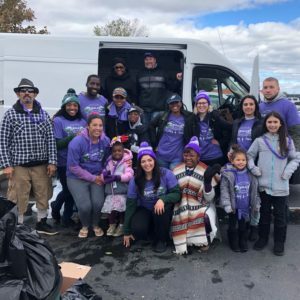 (Philadelphia, PA) October 21, 2018 – The Epilepsy Foundation Eastern PA kicked off November Epilepsy Awareness Month (NEAM) early with an Eagles’ Tailgate. Celebrating the EFEPA’s selection as an official Community Red Zone Organization, our purple tent and epilepsy awareness Eagles shirts drew a crowd. Members from across our community came out to enjoy food, drinks, games and good company at Lincoln Financial Field. We had a special appearance from Jenny Joyce of Fox 29 who covered the event and featured stories from EFEPA champions Korey Walton and his mother, Dawn. Korey has been attending Camp Achieve for the past three years and quickly found a community there. 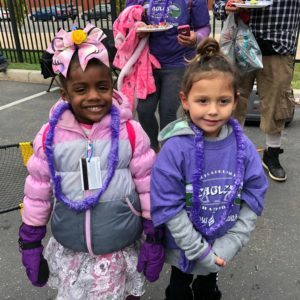 Diagnosed with epilepsy at four years-old, Korey struggled to connect with others his own age. Camp Achieve gave him a place to meet kids sharing similar experiences. The Walton family did a great job of sharing their story and shedding light on the challenges of living with epilepsy. 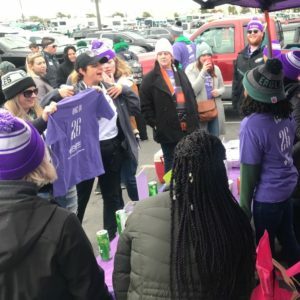 While the Eagles might have flopped against the Carolina Panthers, our first Epilepsy Awareness Tailgate was a success! As the official Community Red Zone Organization, EFEPA’s mission was shared with Eagles fan on the jumbotron. We connected with our community and met some new supporters at the tailgate and at our Foundation’s table inside the stadium. 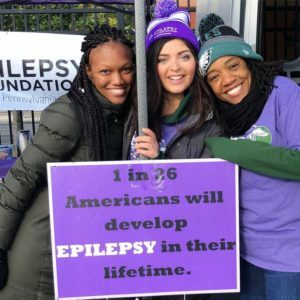 It was a great kick off to 2018 November Epilepsy Awareness Month.